Philip Lasser: Concerto for Piano "The Circle and the Child"
Simone Dinnerstein has become well known for performances and recordings of music by J.S. Bach. Her 2007 Telarc recording of Bach's Goldberg Variations was one of the bestselling Classical recordings in the early years of the 21st century, reaching number one on Billboard's Classical Chart and number four at Amazon.com in all genres! It was critically acclaimed as well. She has since turned to a variety of repertory by such disparate figures as Beethoven, Schubert, Copland, Webern, and various contemporary composers. In 2014 Sony released another highly successful Bach CD by her that contained 15 Two-Part Inventions and 15 Three-Part Sinfonias. Here she turns nearly as far away from Bach as you can go, with an American-French themed disc of works by Ravel, Gershwin, and the contemporary American composer Philip Lasser, whose parentage is American-French. Hence, the title of the CD Broadway-Lafayette. Dinnerstein's take on the Ravel G Major Concerto is a hearty, robust one, with fairly moderate tempos but with a lively and spirited sense throughout. The Gershwin-tinged jazz elements in the first movement are played elegantly but with a relatively potent tone. Dinnerstein's tempo for the lovely second movement main theme seems perfect: she wisely resists the temptation to play it very slowly, avoiding a trap so many pianists fall into. Again, she keeps her dynamics generally well above piano and her phrasing is sensitive and intelligent. The finale has plenty of zip and spirit, and the music seems as playful and witty here as in any other recording. Dinnerstein associates the first movement cadenza with the sound of the theremin, that eerie sounding instrument that popped up in so many 1950s sci-fi films. I think she's onto something: with its continuous trills in the right hand, the cadenza's music does call to mind that instrument, though I must admit I had never made the connection before. Ravel often incorporated ideas or styles fashionable during his time, and the theremin was quite a fad for several decades beginning in the 1920s. Leonard Bernstein made an excellent recording of this concerto and Argerich has made three, one on video (EuroArts DVD 2057898). This one by Dinnerstein is in their class, in part because Kristjan Järvi draws splendid playing from the MDR Leipzig players. Philip Lasser's three-movement piano concerto is titled The Circle and the Child. The composer explains in the album notes that the "circle" is a "powerful metaphor for life", and the "child" represents "the repeating cycles of life, that ceaseless circle from life to life." In an interview posted on YouTube Lasser said of his concerto, "I'd like to say almost jokingly that (I) had always anticipated it to be the piano concerto that Debussy never wrote". Well, despite that statement, as well as his apparent sympathies with French music, and his own family background (his mother is French), the work sounds decidedly American. Oh, there are some things that hint at or suggest French music styles, but they are not predominant. The composer tells us further that the concerto was inspired by a Bach chorale (Ihr Gestirn', ihr hohen Lüfte) which is used in the second movement. Few listeners would likely identify much that sounds like Bach here, but the music takes on a more serious character from the generally chipper and lighter moods in the outer panels. Overall, Lasser's concerto, a recording premiere here, is very compelling, from its sunlit opening (the piano plays a five-note motif rooted in the Bach chorale that seems to act as an awakening of sorts) to the magic and mesmerizing ending of the finale. (The main theme in the finale does sound like an updated take on Bach.) Lasser's style often seems to straddle a sort of slightly bluesy world and a more serious yet innocently hopeful one. His orchestration is rather transparent and textures are fairly lean. Stylistically, this concerto is conservative, very approachable, less modern sounding than most contemporary classical music. There are a few hints of Copland and maybe David Diamond and Gershwin, and occasionally even of Francis Poulenc. I thought of Elie Siegmeister too, from works like Sunday in Brooklyn, but I quickly realized that kind of jazzy and percussive manner are basically not evident in Lasser's music, though there is a sort of kindred spirit. At any rate, familiar as Lasser's style might sound, it's hard to discern any specific influences, though you can observe that his music exudes a kind of generalized American folksiness that's more urban than rural or bucolic. But it is far more sophisticated than that description might imply and in the end Lasser is certainly no imitator. Dinnerstein's performance of the concerto is quite brilliant, perhaps superb (but what comparison can be made? ), and Järvi again gets fine, spirited playing from the orchestra. By the way, the concerto was written for Dinnerstein and premiered by her with the Atlanta Symphony Orchestra in 2013. For those interested in contemporary piano concertos of a conservative bent, this disc is worth the price for just this piece alone. The Rhapsody in Blue is another success here, not least because Kristjan Järvi captures Gershwin's jazzy festivity and sassy swing with such spirit. The orchestra has a large role in this piece as those familiar with it are aware and the MDR Leipzig players' contribution here is simply superb. 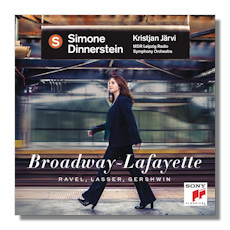 Dinnerstein is on target as well, offering a somewhat greater range of dynamics than in the Ravel, and she is very subtle, always elegant at the right moments, and sometimes playing with an irresistible nervous energy. This is simply a splendid performance by Simone Dinnerstein. (By the way, her name is pronounced Simona Dinnersteen.) There are countless excellent versions of the Rhapsody in Blue, but this one can challenge the best. The sound reproduction by Sony in all works is vivid and quite state-of-the-art. Highest recommendations!